Toronto, April 3: A day after British MPs were unable to decide on a common action plan for Brexit, the UK Prime Minister Theresa May has said that she will go to the European Union and seek an extension on Brexit. She intends to seek an extension to "break the logjam" in UK’s Parliament. As of today, the UK has ten days – until April 12 to bring an exit plan to the EU - which then has to be accepted by all members of the trading bloc or it will get forced out without a deal. Theresa May has said she will speak to the opposition Labour Party for a deal that brings some of their points on the table to try and get a bill that will get a majority in Parliament. Till date, all three of May’s Brexit bills have failed to win the majority vote in Parliament, with many of her own MPs voting against it. Labour Party leader Jeremy Corbyn said he would sit down with Theresa May to find a way. Corbyn told the BBC that, “I have been meeting MPs from all parties from the last couple of weeks. Yes, there is some common ground [and] there are some areas it is difficult to agree on. But there is far more that unites people on both sides about the kind of society we can be than divides them.” He added, "We will discuss [this] with the prime minister. I don't want to set any limits one way or the other." 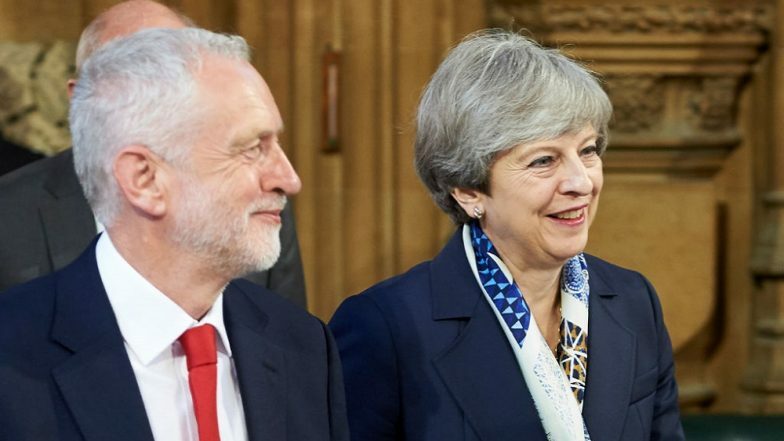 However, in the days ahead Corbyn seems to hold the upper hand as the Labour’s Brexit plan which includes a customs union with the EU and protection of workers' rights, has garnered the most in a “series of indicative votes” which were held over the last two weeks in the British Parliament. The votes were called by the British MPs who believed Theresa May did not hold the confidence of the House of Commons after her Brexit Bill was soundly defeated multiple times.